The First year-what a precious time! Lately I have been feeling so nostalgic over the time when my girls were infants. It really does seem like yesterday that Chelyn was learning how to crawl and now she cooks alongside me in the kitchen! What really speaks to me about those days is the realization that the activities and toys the girls played with as babies didn’t have to be an expensive investment from a fancy toy store. The activities they used were simple and beautiful. I wanted to share with you how to choose these activities and what activities you can offer during the first year of life. We always want to think about offering the infant natural materials. Wood is beautiful, warm and durable. It’s solid but not too hard and smooth to the touch. For some things you can use metals such as silver especially for rattles and teething rings. It’s not only beautiful, but easy to clean! Let’s consider the colors of these activities too. The colors of the materials can be in their natural shade or painted in the primary colors (red, yellow, blue) with non-toxic paint. With all the toys on the market right now, it can be hard to decide what is best to choose once you find a source for these materials. We want to consider what the activity will help our child develop. A newborn is learning to control his eyes, so the activities we can offer should help him to see – to encourage him to focus. Mobiles are a wonderful first toy to offer. Click here for my post on mobiles to learn more. By the third or fourth month, the infant is learning how to slither and gaining more control of his arms and hands, so look for balls that he can bat around. Also, look for natural, nontoxic lightweight objects proportional to the size of his hands. By six months, the child is developing their eye-hand coordination and it’s a great time to have a “treasure basket” available. This is a basket containing objects that the child already knows. Choose about 3-4 objects and change them out regularly (Please note that the safety of the child must always be kept in consideration. 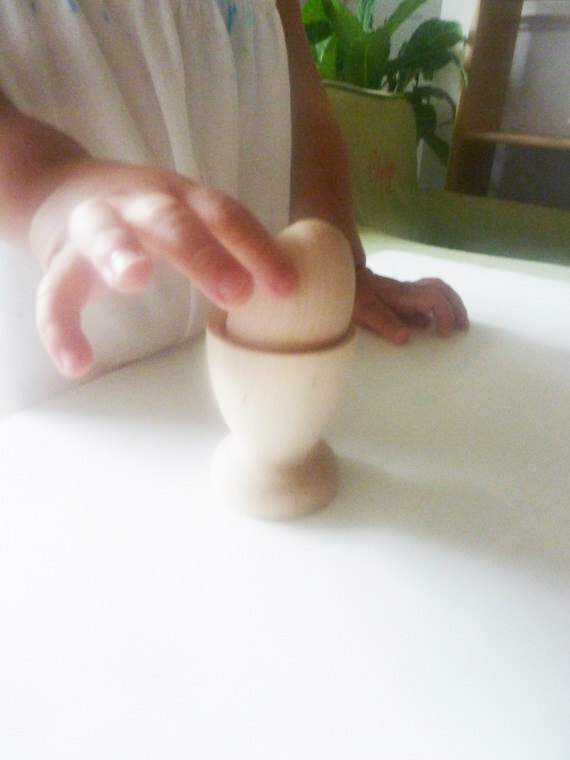 Choose objects that are not too small or sharp) Think about offering objects that have different textures such as a hairbrush, a large ball and a teething ring. Months 8-10 can further support the development of hand-eye coordination and offer activities to support the experience of object permanence (understanding that objects still exist even when they can’t be seen). Activities of this kind involve putting a ball in one hole and having it exit from another hole. These activities can be purchased or made using a shoe box or oatmeal container – get creative! At 12 months, activities continue to develop the hands and fingers while supporting the understanding of object permanence too. Look for boxes with balls to push or wooden blocks that hold colored cylinders. You can also offer a basket with objects to open and close. Choose a basket and place inside 3-4 boxes and jars with lids. This is a great activity because it can grow with your child. The objects should be easy for the young child and grow in difficulty as the child grows. As your baby grows with these activities we also continue to support their movement by offering lots of space to move, furniture heavy enough to support the child pulling themselves up to a stand and lots of time outside in nature! Want to learn more? Become a subscriber today! Don’t miss out on great Montessori tips and ideas! Join the Bellas Casa family today.